Today, being the Chinese Dragon Boat Festival, people are currently in the midsts of eating, drinking and being merry. However, as a large part of Chinese life is taken up with the former two occupations causing the latter I see little difference at the moment. This is the summer festival commemorating the death of legendary poet Qu Yuan and, through several steps of death, fish food and boats, we end up eating zongzi, a rice dumpling filled with red bean paste. Beer also seems to be a highly consumed item though I'm not sure that the poet was a heavy drinker himself. Anyway, in a bit I will head to the local beer garden to remember the valiant efforts to prevent this figurehead of Chinese literature becoming food for the fishes. When not passing off weekday drinking for significant historical nostalgia I've been crawling through the muggy evenings with a few activities. Most significant among these was last night when I cooked the first meal which was really, genuinely cooking as I know it from my past. Not that I was cooking English food but that it contained several ingredients and consisted of more stages than simply opening a bag of dumplings, boiling said dumplings and consuming cooked fare. With carefully thoughtover quantities of chili, szechuan pepper, pork, soy and rice vinegar, the creation was a thoroughly wholesome feast when added to the other dishes which had been prepared and, when I finally get my fridge, I hope to do this far more often. Yesterday evening was spent drafting a letter to the Italian ambassador to invite him/her to the grand opening of Strings 2006 which will be a public lecture in the great hall of the people. It was with great restraint that I mentioned Ferrero Rocher at no point in the text. On top of my English corner lesson, which was distinctly underpopulated this week as many people are finishing projects at the moment, I taught my first one-on-one English class. Having never taught like this I didn't know quite how it was going to pan-out but I soon realised that it's actually a lot of fun teaching someone who's English is already at a pretty decent level. When learning Chinese I spend most of my time asking about the roots of words and why two words look or sound similar (I think this pleases and infuriates my teacher at a reasonable equilibrium). Unsurprisingly perhaps this analytic bent of mine influenced my teaching style and from a list of fifteen words we spent almost two hours exploring how they all linked together and could be used in different contexts. My student seemed pretty happy with the lesson so I hope to do more of this in the rapidly diminishing free time I still have. I still have some topics I mentioned from a few posts ago which mean to discuss, but pre-beer garden is not a good time. I can indulge briefly and mention a film that I've been wanting to watch for some time and have only just got my hands on. THX-1138 was George Lucas' first movie and was based on a short he did while at university. Produced in 1971 by Francis Ford Coppola and starting Robert Duvall, this pair not only went on to make the Godfather films but also between the G.F. parts one and two, made one of my favourite movies, The Conversation. The Conversation is slow, with a minimalist jazz soundtrack and a superb performance by Gene Hackman as a surveillance expert asked to listen in on a conversation. It turns out that what he hears puts him in a morally difficult situation. The film is about sound, paranoia and interpretation and I shall say no more because I think that the less you know about the film, the more impact it has at the critical moment. 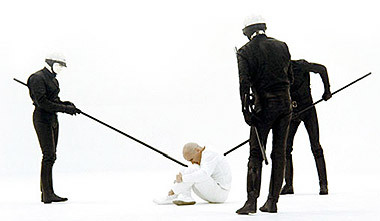 Anyway, THX-1138 is a dystopian fantasy drawing heavily on Brave New World and 1984 and takes place in a world where love is illegal and people spend their time in a drug induced state of emotionlessness in order to be more productive, buy more and build a 'happy' and constructive society. As in all (as far as I can tell) dystopian tales, the main character somehow gets out of sync with society and rebels. The story itself is not a unique one but the filming is beautiful with techniques from photography 101 taken to their logical conclusions and beyond. A few years ago the film was remastered making it look minty fresh which many hard-core film fans seem somewhat dismayed about (or at least about the fact that Lucas has not let the original be released on DVD). There's little in the way of character building but this is clearly a deliberate point as the characters are so shallow, never having been allowed to become fully aware of their emotions. A large part of the film is spent listening to people order commands which are meaningless to the viewer and, in the grand scheme of things, presumably meaningless overall. As long as you don't mind these two points and have an attention span of more than a few minutes, this is a satisfying film to ponder over for a little while. (Incindentally, references to THX-1138 are in all of George Lucas' subsequent films and a few others to boot). Right, the beer garden beckons. I take it you sacked off the Elvis quiz then in your one on one lesson? Have you managed to eat a takeaway English yet? Yep, no Elvis quiz this time. I have to prepare the students well in advance of that one. No takeaway English but I did have a steak of quite astounding ingenuity a couple of weeks ago. They asked me how I liked it done and I replied medium (I would normally go for rare but wasn't sure when the last piece of steak had been ordered from that restaurant). After half an hour the steak was brought to my table and indeed it was almost exactly medium...it had been cooked thoroughly on one side only, the other side was still room temperature. Not impressed!